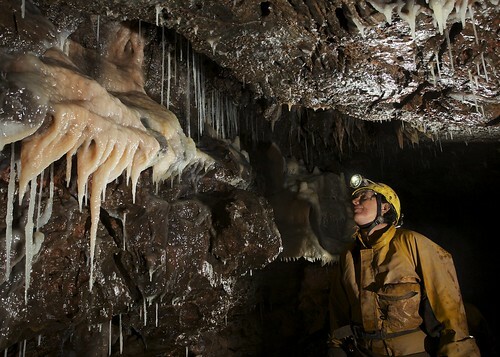 A trip to the Far North of Dan Yr Ogof is one finest caving trips you can take. Almost all visitors will take the Left Hand Series following the massive passages to visit the Far North Chokes at the end. In doing this the smaller sized passages of the Right Hand Series are missed which take the cave further north that the other branch. We decided on this trip to make our target the end of the passages on the Right Hand Series and ignore the larger passages on the standard route. Knowing that the passages in our target area were smaller than those of the other branch we took a lightweight (1 Pelicase) camera kit with us. Starting into the cave at 8.30am we made good time to the Starting Gate, the point where the two route diverge. We followed the water coming from the Right Hand branch and soon following a much smaller passage, crawling over fallen blocks. The passage was mostly low with a section of flat out crawling before the stream was regained and we crawled along a small tube over the stream in a rift. 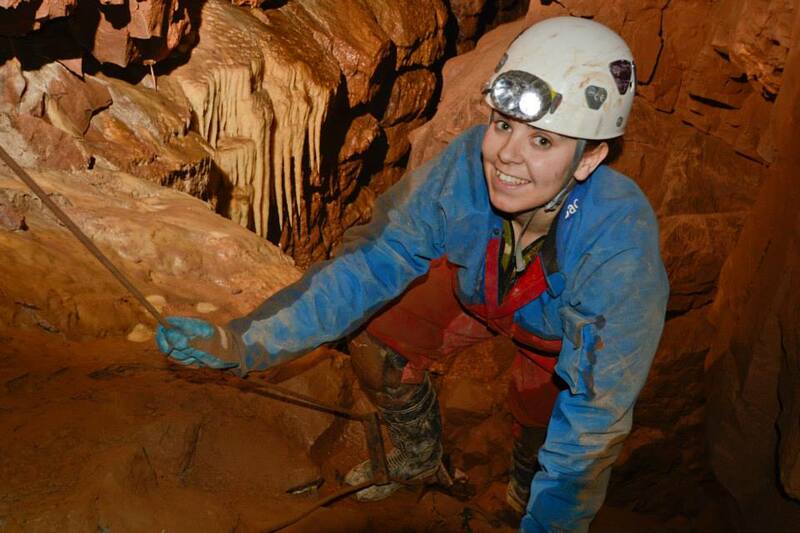 After 150m of mixed caving we broke out into a larger stream passage which was quite pleasant for 100m or so. Ice Cream Aven was explored on the left while stream inlets were followed on both sides until they choked or emerged from avens. A climb up and a traverse led to the final section of this branch of the cave where a hole in the floor of a chamber led to a large passage with sand chokes at the lower end and a boulder choke upstream. Back at the car park after 12 hours underground we were eaten alive by the midges. Brendan, Jess and Mark were staying at SWCC for the weekend. 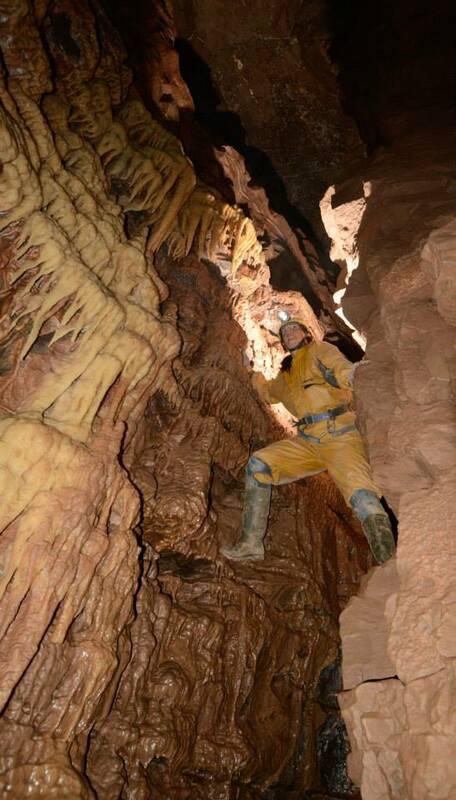 They had planned a mega-trip into DYO on the Sunday, but not could decide on a caving trip for the Saturday. 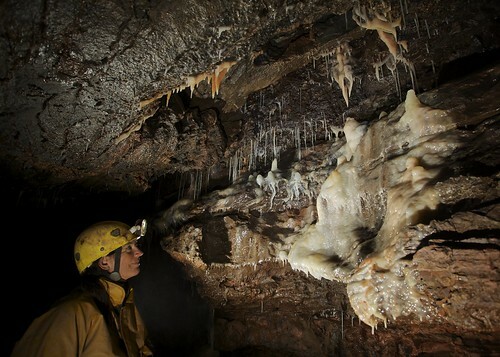 These days I have to be motivated to go caving. 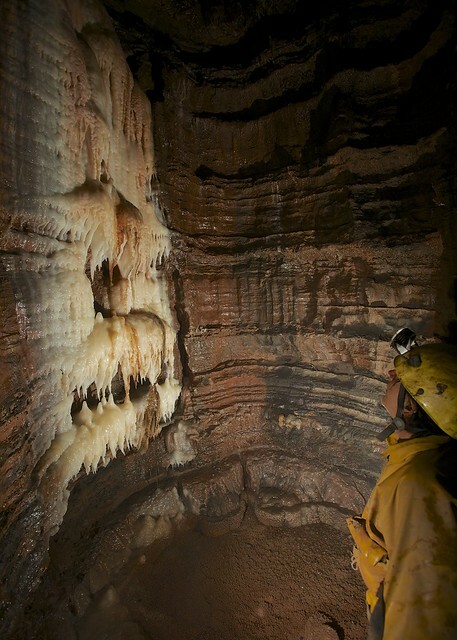 Just going caving isn't enough. I have to have a purpose for the trip, so I wasn't really thinking of joining them on the Saturday unless they could come up with a trip that inspired me, and blank faces told me they hadn't. 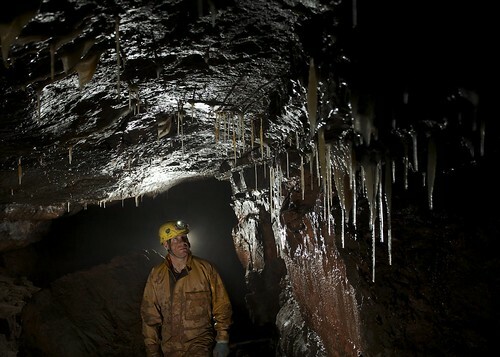 Then in a moment of madness I suggested a return visit to Upper Piccadilly in Ogof Ffynnon Ddu. I had been to this area of the cave on three previous occasions, but there was still one high level passage that none of us had not visited. Our first visit was to have been Jess’ first SRT trip but when Brendan and I got to the top of the pitch and saw the state of the ring bolt and the awkward ‘get off’ we decided that it wasn't suitable for Jess after all. On the second visit we got a little further, but were put off the next stage of the exploration by an exposed 60 degree climb up a calcite slope. We took along a fearless climber, Mark, for the third visit and got up the slope by means of a hand line rigged by Mark and got to photograph the magnificent rock bridge, but couldn’t complete our exploration as the next climb up was extremely exposed and the only means of ascending it was by climbing an electron ladder of unknown antiquity. Jess hadn't accompanied us on trips two and three so had yet to see any of these high level passages. To my surprise they all readily agreed – not put off by the dodgy ring bolt, the awkward ‘get off’, the exposed climb up the calcite slope or the unknown ascent to the final high level passage. What could possibly go wrong? All continued to go well as we made our way to the ‘pull through’ pitch up to Upper Piccadilly. As the lightest I was elected to go up first. At the top I blanched as I inspected the ring bolt, my single point of attachment on the climb. I quickly got off the rope and rigged a back up so that the others could come up in relative safety. Our rope was still in situ on the impossible calcite slope so we all managed the climb up easily. It was now time to visit uncharted (well uncharted as far as we were concerned) territory and it was Mark’s turn to enter the danger zone. There were two old spits in the left hand wall and we used these to give Mark a little protection, even so we all held our breath as he managed what seemed an impossible climb. We had taken the rope off the first climb and Mark rigged this from a large boulder so that the rest of us could attach an ascender to it to protect us one the climb. The passage at the top is massive and consists of a very steep slope of loose boulders terminating in a large boulder choke. 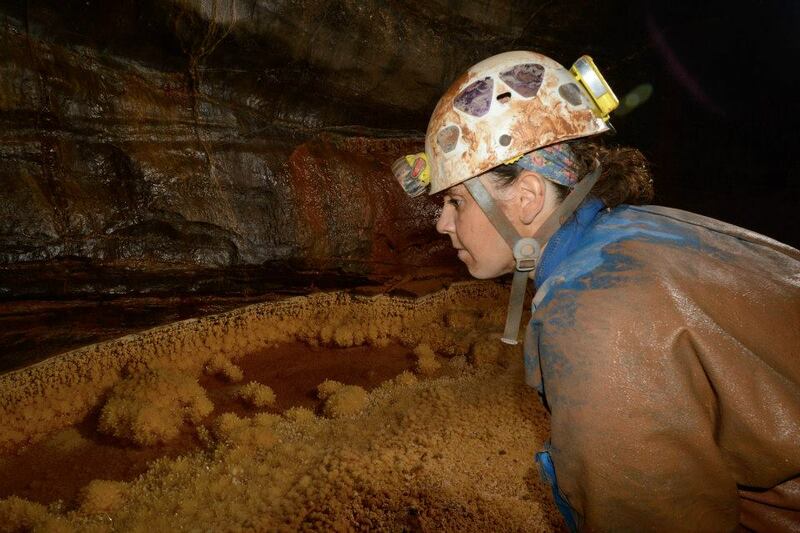 It was obvious that we were in a very little visited area of the cave. We spent some time ferreting about in the choke looking for possible ways on before starting of journey out. Coming back down the loose boulder slope was an interesting experience. We has to come down one at a time as with almost every step a boulder was dislodged and went crashing down the slope. Eventually we were all safely down and were getting out of our SRT gear while Mark was de-rigging the pitch and stashing the rope back in the tackle sack. We all felt a great sense of relief that the most dangerous part of the trip was over. As we started to move off Mark smiled and said, “Well no one died or nufink.” Famous last words! As we walked up Nether Rawl on the way to the Smithy, I slipped on a simple climb, slid down about two feet and landed on my feet. The rest were therefore a little surprised when I fell on the floor, swore loudly several times and did a very good impression of rolling on the floor in agony. What they didn't know was that a few weeks ago I had torn the ligaments in my upper left arm and had pulled them again as I slid down. Ligament pain I am told is worse than a break and I can believe it! 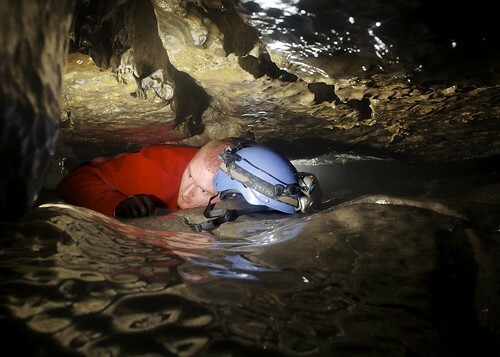 After about ten minutes the pain started to subside and I tried to assure my caving buddies that I was OK to make my way out, but they insisted on carrying my SRT gear and camera bag. 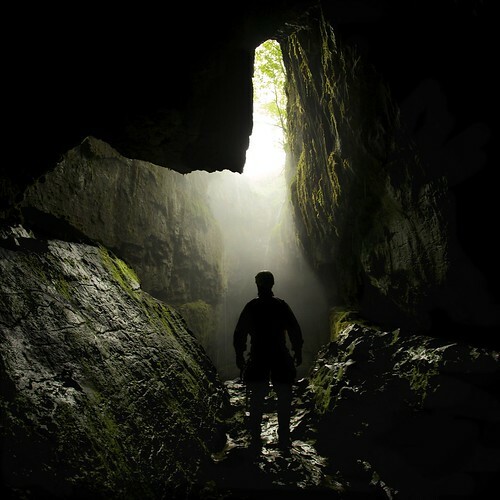 So it was a very easy exit for me from the cave, but I don’t think I’ll pull that stunt again. 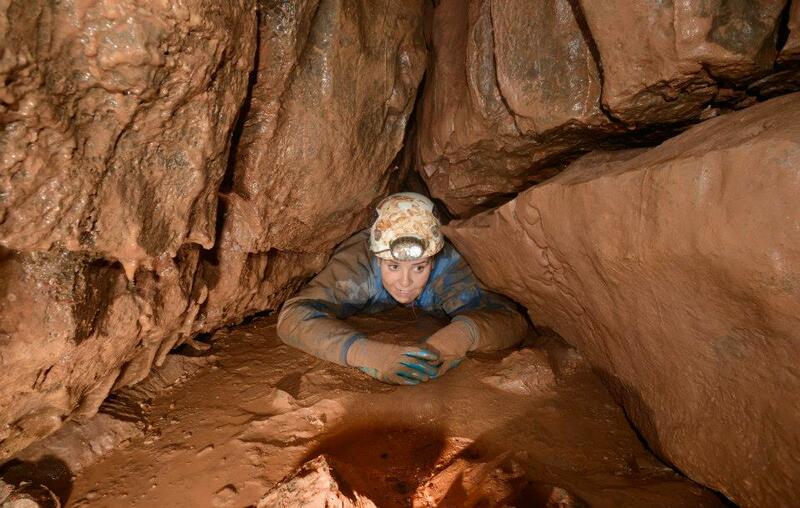 When Chloe turned up at the club one Thursday for the first time and was asked why she wanted to try caving, “I want to find something that scares me” was the answer she gave. Since then she has been caving regularly and has gone from strength to strength, so when she asked for a caving trip to celebrate her birthday, Mark thought he’d sort out a memorable one – the upper oxbow in OFD II, with a choice of the easy route up the Skyhook pitch or the more challenging one across the Midnight Traverses – guess which Chloe chose? Going via Edward’s shortcut, where Chloe demonstrated a ‘dive-bombing’ caving move, cushioned by Mark who didn’t get out of the way in time, we first went to the Skyhook pitch, where Mark rigged the rope and we attached our SRT kits to it. We then arrived at the Midnight Traverses in good time. “This is the worst bit, if you can do this, you can do anything” said Mark. Mark meantime was ‘sorting something out’ at the top of the ladder pitch, and once we got to the top we found that he had discovered that one of the ropes between the rungs of the old ladder was badly damaged, so he had reinforced it with a sling so that we could climb safely. “Yay, you’ve done the worst bit now!” said Mark, just before we came around a corner to see a rather intimidating climb up. “Oh, I forgot about that” said Mark. He whizzed up and down to show us the way, followed by me and then Chloe. I found that there were enough hand and foot holds to manage without help, but poor Chloe’s legs were still doing the Elvis shake. However she didn’t give up, and with more than a little moral and physical support from Mark she got to the top. “Actually, maybe that was the worst bit” said Mark. After a lot of grunting and squirming with no gain, ”Just leave me here!” said Chloe. I popped back in again to get behind Chloe to give her some purchase, and with her wellies squishing my helmet onto my head she was able to push herself out. 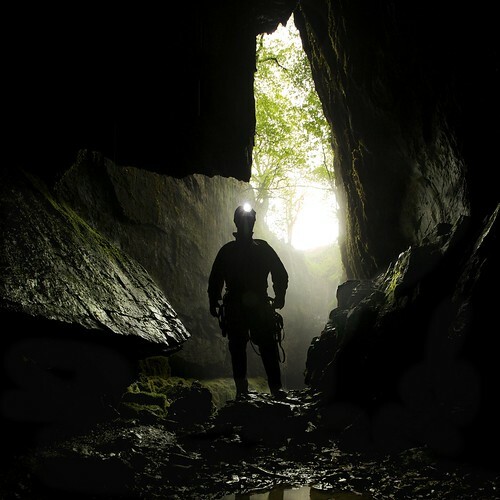 The only obstacle left was the skyhook pitch, which in typical South Wales caving style involved a suicidal climb down to the pitch head itself. “I did remember that”, said Mark, “But thought I’d better not mention it!” Using a couple of slings we safely gained the pitch head and were swiftly back down and ready to head out. All in all a really enjoyable trip and one which Chloe says definitely fulfilled her caving ambitions and gave her a birthday trip to remember! After a fun couple of days doing Alumn Pot on the Friday and Swinsto pull through on Saturday, it was time to head off for breakfast at Inglesport before our White Scar trip. After a mile or so I noticed a grinding noise which was getting louder by the minute and finally went bang. In the side mirror I just got a chance to see bits flying every which way before I registered that it was most likely the brake pads going to pieces! Gently I coaxed the van to Ingleton and decided there wasn't much I could do about it till later so enjoyed a hearty breakfast before making my way up and down the steep hills to White Scar trying to use engine braking and gentle application of the hand brake. At the cave we split in to three groups with Ben, Carl and Grant forming the first team, Bartek, Paulina, Chloe, and Brendan in the second and Keith, myself, Heather, Becca and Ian in the last. 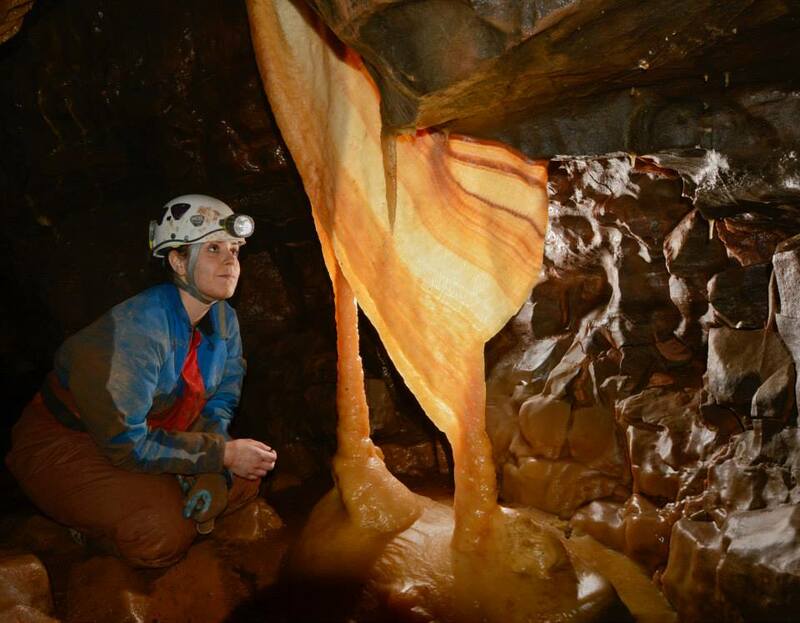 White Scar has a very unusual raised scaffold floor in its show cave and gives a true feeling of being in a 'wild' cave rather than just a walk about. Before heading in we took a detour to take in 'Battlefield Cavern' before heading to the lakes. Keith took a little video on the way in and after a real soaking I lead us in to the boulder choke only to miss the way through. Keith shortly arrived and after a quick poke around spotted the climb up. On the way in we went through the Big Bertha duck and after another soaking were soon heading down some pleasant stream passage with the occasional boulder climb. We reached a slippery climb up to a pretty straw chamber where Keith joined me via a climb assisted by an ancient looking piece of tat. Then Becca decided to have a go. Keith has somewhat longer legs than Becca, so a move he had made look easy for Becca was impossible and she found herself dangling on the end of the rope until Keith reached down and lifted her up to the muddy ledge. After this again it was easy stream passage till we met the lads at a ledge where they were having fun and games jumping in a deep pool. Passing this the cave changes character and a fine scalloped ceiling drops to almost meet the water where a few hundred meters is easier swam than crawled and the occasional duck just adds to the fun. On the way to the sump we passed Brendan's party on their return. After a quick peek at the uninviting but free diveable sump we again paused to take a little video before retracing our footsteps. On the return we went for the awkward climb out rather than the duck and were soon back in the sunshine. After a cuppa and cake in the cafe we all said our goodbyes and headed off. Without brakes I made short work of the journey home, in fact there was no stopping me! 1pm and we arrive at Bernies to find Peter Collings-Wells and Jo White and indulge in a full blown SWCC tea drinking session with them. Meanwhile Ben, Grant and Carl drive. 3pm and we are changed and head up the track to Alum Pot. 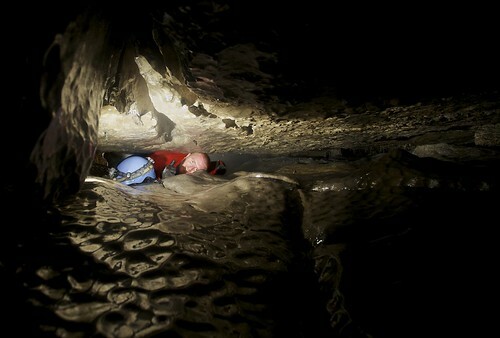 Ben, Grant and Carl take a bag of rope to drop a big pitch into the cave. Mark and Brendan take the other two bags of rope and head up to Long Churn to rig in via the Dolly Tubs. With both hands holding tackle bags Mark followed by Brendan end up neck deep in the Plank Pools, we drop the Dolly Tubs pitch and arrive at the balcony overlooking Alum Pot wet and rather cold. Ben, Grant and Carl are dropping down the pitch at the far side of a very misty looking Alum Pot. Mark rigs down to the Greasy Slab and across to the Bridge where we meet the guys. Mark rigs from the Bridge, while the others drop down to the bottom from the rope they have rigged. 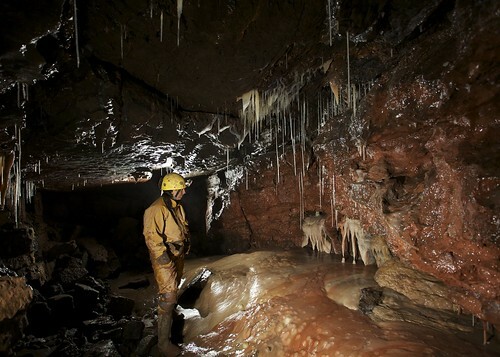 Mark meets them at the bottom and rigs the final pitch to take them to the sump. We all exit via the Dolly Tubs diverting to let the slimmer members go through the Cheese Press. 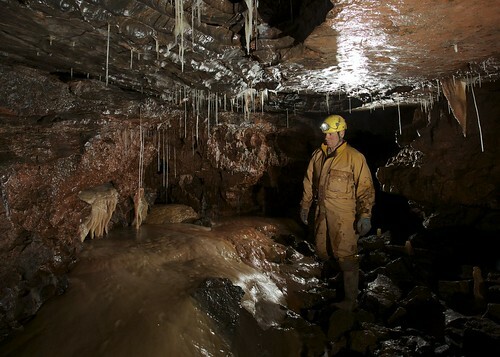 9pm and we are out of the cave, changed and heading to the Bradford Caving Club. After something of a lie in (as our alarm didn't go off), Jess and I finally arrived 15 min's late to meet up with Andy and Mel in Buxton before heading off to an empty Giant's Hole car park. There was some wardrobe debate before I decided on a rather fetching neo-fleece with matching knee high wet socks, then set to stripping my SRT kit to a minimum to fit in the kit bag with the 4 pitches of rope. We made short work to Garland's where it was rigged for SRT, followed by a stomped down the crab walk. Pausing at the vice I had a go at going through rather than under, much to Andy's amusement when I got stuck with legs waving in mid air! After finally admitting defeat......for now, I popped back through and we headed off to Valentine sump. I crawled through the initial damp passage to the dam where the bellows are for the syphon and then went in to the sump to check on the pipe work. After some coaxing Andy came through to take a look, and after quarter of an hour of playing we found the bellows were sucking air and stubbornly refused to play. Andy pointed out at this point that the girls would be getting chilly by now so we re-grouped and continued on over bad step traverse and on to the climb down and Geology pot. We soon found our selves at the ducks, which although water levels weren't too high, were very refreshing for those who hadn't donned neoprene. Foam lines on the walls to the east canal showed the passage certainly wouldn't have been a place to be a couple of days before and we were all grateful for the few days of fine weather since. Mel had been feeling a little rough before we'd entered the cave and was now looking grey and shivering so we decided enough was enough for one day and swiftly headed out. Back in the sun and out of the wet gear Mel had begun to look a bit better, so we headed off to the pub for a quick pint before the drive home. Another great day out with all routes now discovered ready for a future return with some repair kit for syphon and perhaps a little more neoprene and a rubber ring for Andy, and a sherpa to carry the kit for me on our return!